Glen Innes to Tamaki Drive Shared Path – Remuera Residents Association Inc. 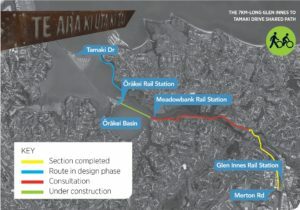 The NZ Transport Agency and Auckland Transport are creating a 7km-long shared path from Merton Road, near Glen Innes Train Station, to Tamaki Drive – allowing people to walk, run or cycle from Auckland’s eastern suburbs to the Waitemata Harbour. This project is being delivered in four sections. Designs have been prepared for Section 2 of the shared path for community input before they progress to construction. The transport agencies have listened to feedback about the visual effects of the new balustrade on Section 3, and have developed three indicative design options to address these concerns. Feedback is being sought by Friday 9 November 2018 on the proposed design for Section 2, St Johns Road to Ōrākei Basin, and on a replacement balustrade for the Ōrākei Boardwalk in Section 3. Have your say. Recent comment by Meadowbank& St Johns Residents Association.